Old Masters & 19th-Century Art at W. M. Brady & Co.
Fine Art Shippers has long been a preferred art shipper for many reputable galleries and auction houses in the United States and beyond. We ship art of any kind, from oil paintings and drawings to art installations and oversized outdoor sculptures. Besides, Fine Art Shippers is also proficient in handling and moving antiques and museum-quality artifacts both nationally and internationally. However, there is nothing like shipping Old Masters and visiting galleries specializing in this particular kind of art. In our previous blog posts, we wrote about several of them, including Robert Simon Fine Art and Otto Naumann Ltd., and now want to tell you about W. M. Brady & Co., another great NYC gallery that can be easily recommended by each art shipper on our team. 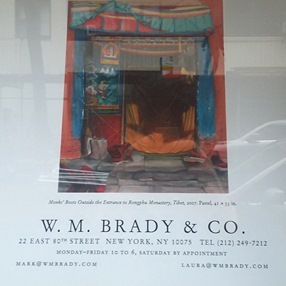 Founded in 1987, W. M. Brady & Co. is a very beautiful art gallery located at 22 East 80th Street in the Upper East Side of Manhattan. Specializing in Old Master paintings and drawings, it is a must-visit place for all connoisseurs of classic art. Besides, W. M. Brady & Co. also has an outstanding collection of 19th-century European art with a focus on English, Italian, and French schools. It is no wonder that this amazing gallery collaborates with some of the world’s most important museums, including the Metropolitan Museum of Art in New York and the British Museum in London. As a professional art shipper, Fine Art Shippers recommends W. M. Brady & Co. to everyone! This unique gallery definitely deserves special attention!